The history of Waalgarage goes back to the time when early Porsche models were still young. Ton Bakker is renowned in the Porsche world. Every day, he comes in to the business he founded around 40 years ago. He still loves working in the garage day in, day out, together with his sons Martijn and Vincent. This is a story of men who turned their boyhood dreams into careers. Growth from the centre to the picturesque Broek in Waterland. 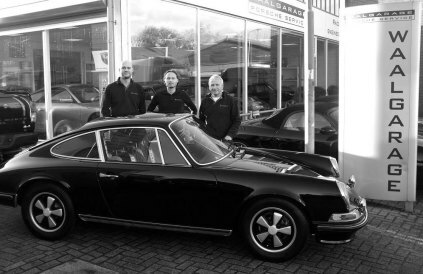 Waalgarage has been the Porsche specialist for 40 years and the business has serviced and repaired Porsches since the early models first hit the road. The company was formerly located on the Kromme Waal, which also gave it its name. Passion for the brand arose on first acquaintance with the then pioneering technology of the Porsche 356. After the 356 followed the first generation of 911s, with which specialisation was a fact. The company's customer base expanded, making it possible to relocate the business from Amsterdam's city centre to picturesque Broek in Waterland, where Waalgarage could take advantage of the proximity of Amsterdam and the peace and space of rural Waterland. Moreover, we are better able to receive you at this location and to service your car in our spacious garage. We have the very latest facilities for keeping your car in top technical condition. Over the decades we have been entrusted with all types of Porsche, allowing us to accrue extensive knowledge that has now been passed on from father to son. The love for the illustrious brand has meant that Waalgarage has found its way to the track. Where else than there are you given the opportunity to muster the full power of a genuine Porsche? We have achieved many successes with the TB Racing race team, at national and international race events. Thanks to our clients' trust in our expertise and experience, many Porsche drivers have already found their way to Waalgarage. That's why we can call ourselves the Porsche specialist. Many new drivers are also finding their way to us and they quickly become acquainted with the hospitality, high degree of technical expertise and service our company is known for.